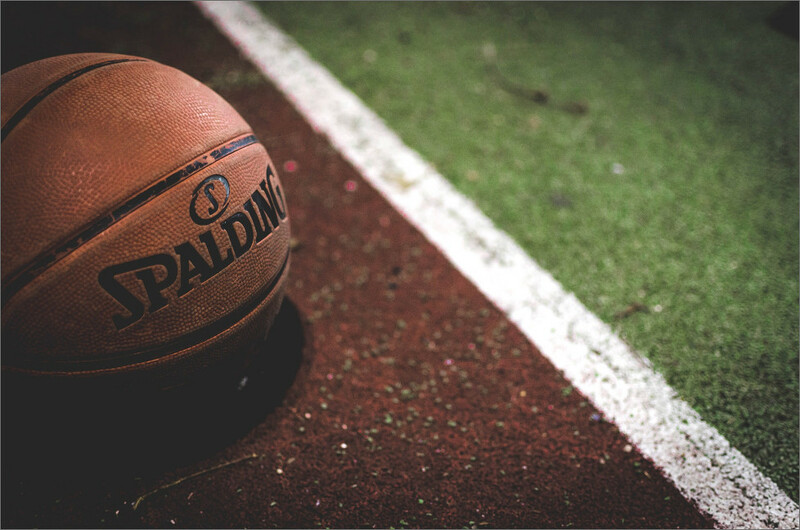 Some of you may know that there’s a basketball thing that happens each Spring. I’ve filled out a few college basketball brackets in my time, but honestly, I tend to vote based on which mascot would win in a fight. This gave me an idea to change some things up and have a little fun. 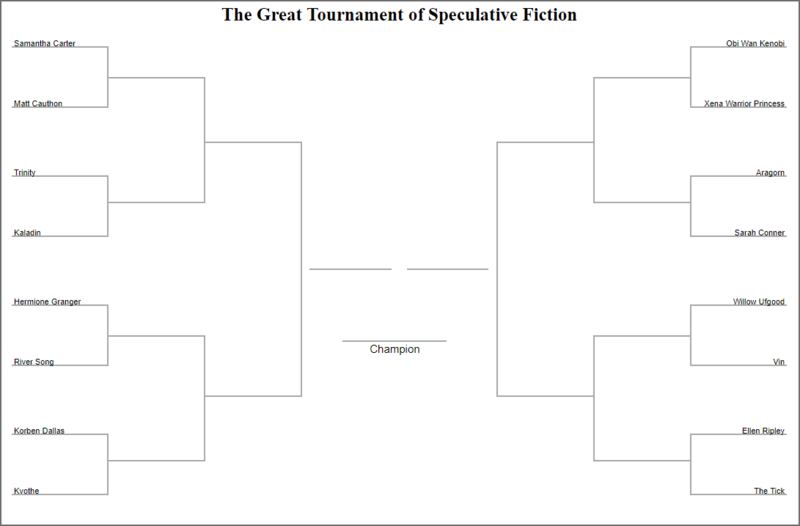 I give you: The Great Tournament of Speculative Greatness! I put together a list of eight men, and eight women from various speculative stories. These are some of my favorite characters in books, movies, and comics. I blended those names with a random generator and BOOM! Bracket time! These are going to be some interesting results! Let’s dive into the rules, see who we have competing and then get to the voting below. One Rule to rule them all. Pick the character you want to see win. You decide on the victor. You can imagine the two locked in fist fight, or a Sicilian battle of wits. Maybe they’re crossing swords on a rickety rope bridge over a river of bubbling lava. Maybe you just like one more than the other. Pick one and move on. That’s it. Kaladin is a slave who strives to do the right thing and bears the weight of the world. One could say that he lives his life with great Honor. Korben is a tax driver, and ex spec-ops in the 23rd century. He has good negotiation skills. The Tick is invulnerable, and tends to leap before he looks. Spoon! Obi Wan is a Jedi Master and general in the clone army. Matt is a roguish gambler with amazing luck. He remembers battles from the lives of hundreds of long dead generals. Ranger king. Aragorn is an expert in sword, herbalism, and has a cool beard. Kvothe is a master musician, swordsman, and seeks the Name of the Wind. Willow is a Nelwyn farmer who wishes to become a magician. He has a good heart and is willing to do the right thing. Vin is a young thief and Mistborn. She follows her instincts to challenge an oppressive government. A furious warrior, Xena is no stranger to battle. Time Traveler, part Time Lord, River can keep up with even the great Doctor Who. Wizard-in-training, Hermione is intelligent and adept at getting her friends out of trouble. Ripley is a protector, and fighter, oh.. and the mother to a race of murderous aliens. Sarah is the mother of the savior for humanity’s future. She’s also pretty good with a firearm. Colonel Carter is a member of an elite team who travels the universe through Stargates. She is smart and deadly with a P-90. Not only can Trinity fly a helicopter, but she can kung-fu with the best of them. Each bracket has its own poll below. Please select your favorite on each poll. When you’re done, leave me a comment to explain why you chose one over another. I’d love to hear your thoughts on some of my favorite speculative characters. Tune in next week for the results and Round Two! I basically just went by whether I had read the book or seen the movie/TV show. Awesome! Thanks for commenting. Who do you think will win the tournament? This is too much fun! Great idea to bring some March Madness to the spec world.